For Hollywood celebrities, the term “splitsville” usually means “check your prenup.” For scientists wanting to mass-produce high quality nanoribbons from boron nitride nanotubes, “splitsville” could mean “happily ever after.” Scientists with the Lawrence Berkeley National Laboratory (Berkeley Lab) and the University of California (UC) Berkeley, working with scientists at Rice University, have developed a technique in which boron nitride nanotubes are stuffed with atoms of potassium until the tubes split open along a longitudinal seam. This creates defect-free boron nitride nanoribbons of uniform lengths and thickness. Boron nitride nanoribbons are projected to display a variety of intriguing magnetic and electronic properties that hold enormous potential for future devices. Nanoribbons are two-dimensional single crystals (meaning only a single atom in thickness) that can measure multiple microns in length, but only a few hundred or less nanometers in width. Graphene nanoribbons, which are made from pure carbon, carry electrons at much faster speeds than silicon, and can be used to cover wide areas and a broad assortment of shapes. Boron nitride nanoribbons offer similar advantages plus an additional array of electronic, optical and magnetic properties. “There has been a significant amount of theoretical work indicating that, depending on the ribbon edges, boron nitride nanoribbons may exhibit ferromagnetism or anti-ferromagnetism, as well as spin-polarized transport which is either metallic or semi-conducting,” says physicist Alex Zettl, one of the world’s foremost researchers into nanoscale systems and devices who holds joint appointments with Berkeley Lab‘s Materials Sciences Division (MSD) and the Physics Department at UC Berkeley, where he is the director of the Center of Integrated Nanomechanical Systems (COINS). Zettl and members of his research group met this challenge using the chemical process known as “intercalation,” whereby atoms or molecules of one type are inserted between atoms and molecules of another type. James Tour at Rice University and his research group had demonstrated that the intercalation of potassium atoms into carbon nanotubes promotes a longitudinal splitting of the tubes. This prompted Zettl and Tour to collaborate on a study that used the same approach on boron nitride nanotubes, which are very similar in structure to nanotubes made from carbon. Zettl and Tour reported the results of this study in the journal Nano Letters. The paper was titled “Longitudinal Splitting of Boron Nitride Nanotubes for the Facile Synthesis of High Quality Boron Nitride Nanoribbons.” Co-authoring the paper were Kris Erickson, Ashley Gibb, Michael Rousseas and Nasim Alem, who are all members of Zettl’s research group, and Alexander Sinitskii, a member of Tour’s research group. This synthesis technique yields boron nitride nanoribbons of uniform widths that can be as narrow as 20 nanometers. The ribbons are also at least one micron in length, with minimal defects within the plane or along the edges. Zettl says the high quality of the edges points to the splitting process being orderly rather than random. This orderliness could explain why a high proportion of the boron nitride nanoribbons display the coveted zigzag or armchair-shaped edges, rather than other edge orientations. Edges are critical determinants of a nanoribbon’s properties because the electrons along the edge of one ribbon edge can interact with the electrons along the edge of another ribbon, resulting in the type of energy gap that is crucial for making devices. For example, zigzagged edges in graphene nanoribbons have been shown to be capable of carrying a magnetic current, which makes them candidates for spintronics, the computing technology based on the spin rather than the charge of electrons. Erickson also says it should be possible to functionalize the edges of the boron nitride nanoribbons, as these edges are terminated with chemically reactive potassium atoms following synthesis and with reactive hydrogen atoms following exposure to water or ethanol. 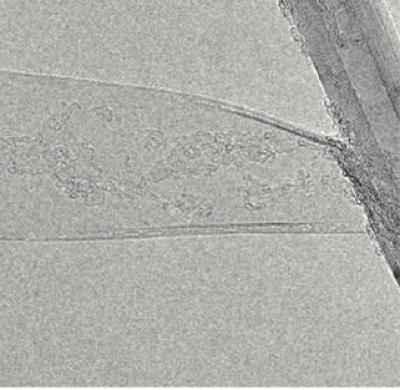 Zettl and his research group are now investigating alternative syntheses using different boron nitride nanotube precursors to increase yields and improve the purification process. They are also attempting to functionalize the edges of their nanoribbons and they are in the process of determining if the various predicted edge states for these nanoribbons can be studied. “What we really need most right now is a better source of boron nitride nanotubes,” Zettl says.